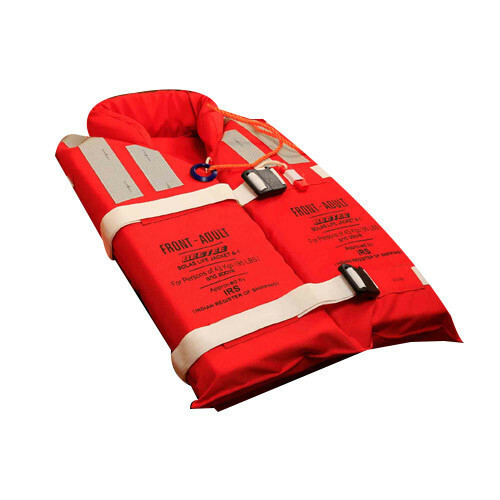 The BEETEE® SOLAS LIFEJACKET A-1, ADULT (PFD) Life jacket is a sleeveless buoyant jacket for keeping a person afloat in water. It is is comfortable to wear within a period of 1 minute without assistance, guidance or prior demonstration and capable of being worn in only one way, allowing the wearer to jump into the water from a height without injury. We have developed these products by making use of quality tested raw materials and sophisticated technologies. Established in the year 1958, we "Bharat Traders" are the leading manufacturer and trader of a wide range of Marine Navigation Light, Lifebuoy Circular and Life Jacket. All the products manufactured by us are approved by the Mercantile Marine Department, under the Director General of Shipping, Government of India.